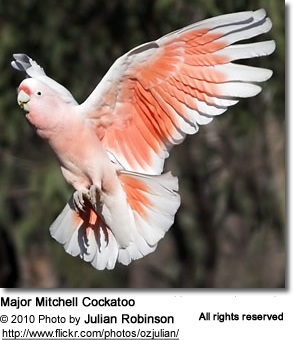 The Major Mitchell is a stocky, medium sized pink cockatoo with distinct yellow and red bands in the crest. This cockatoo species inhabits the sparsely timbered grasslands of central and Western Australia and generally moves in a nomadic fashion to sites with water and more favourable conditions. 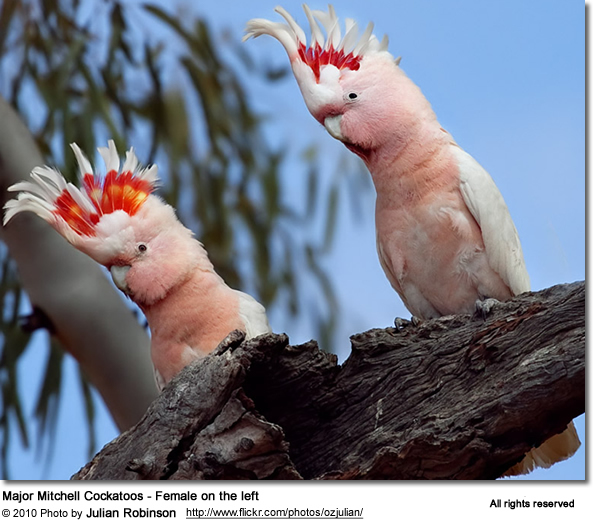 Major Mitchells are usually seen in pairs, often in the company of galahs. Major Mitchells form strong pair bonds and require an owner who is willing to provide meaningful interaction and socialisation. Birds deprived of this activity become susceptible to behavioural problems. 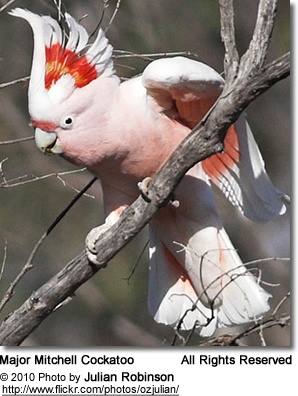 An unmistakable cockatoo of the dry inland, the Pink Cockatoo is the only Australian cockatoo that is salmon-pink below and white above. 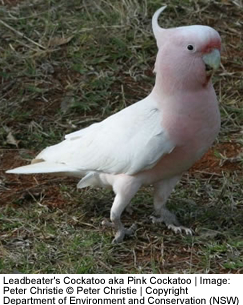 It is smaller than the Sulphur-crested Cockatoo C. galerita, but slightly larger than a Galah C. roseicapilla. Its most prominent feature is its large white-tipped crest that is banded in red and gold. 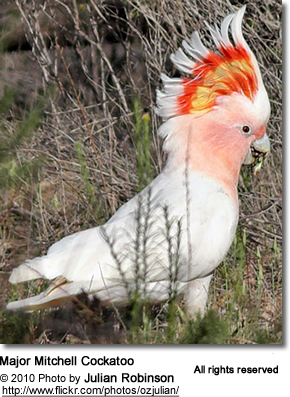 With its soft-textured white and salmon-pink plumage and large, bright red and yellow crest, it is generally recognised as the most beautiful of all cockatoos. 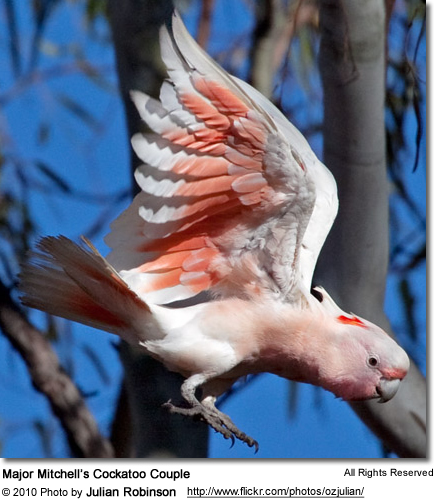 It is named in honor of Major Sir Thomas Mitchell, who wrote "Few birds more enliven the monotonous hues of the Australian forest than this beautiful species whose pink-colored wings and flowing crest might have embellished the air of a more voluptuous region". Its call is a distinctive stammering whinny. "[T]hey need a lot of constant interaction to keep them tame. I left on holiday last year and when I came back Snowy would not come to me. It took a lot of careful interaction to get that back." " Snowy also challenges you and you have to again constantly interact with the bird." " When I first got her she would not eat anything other than dried mango. She now eats a lot of food including scrambled eggs mixed and cooked with a little water, cooked vegetable, she can be bribed even when reluctant with a peanut or more so with a piece of cheddar cheese. This has been really helpful in training her." " She love mirrors and will remember where they are in my home and I will always find her there if she walks off." 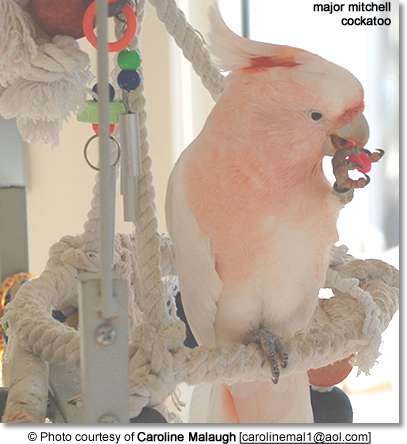 " Snowy speaks a little and has also learned to whistle in key any tune I teach her. She uses this to call me and get my attention." 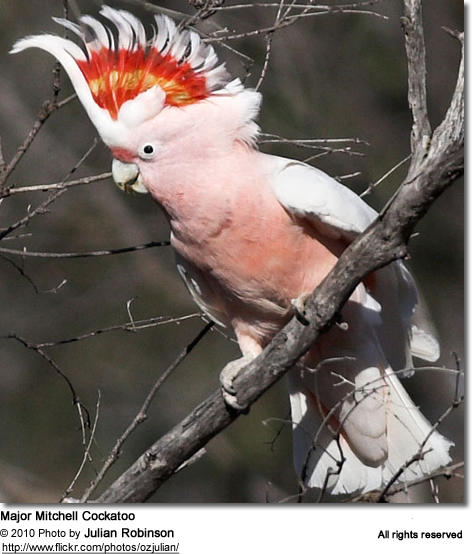 Major Mitchell's Cockatoo (Cacatua leadbeateri), also known as Leadbeater's Cockatoo or Pink Cockatoo, is the only species of its own subgenus Lophocroa. 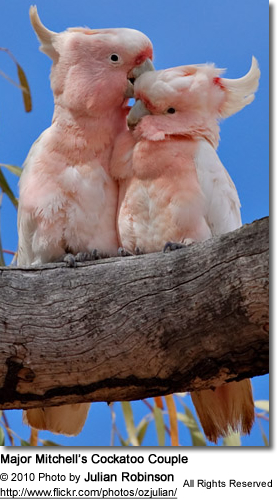 It is a medium-sized cockatoo restricted to arid and semi-arid inland areas of Australia. 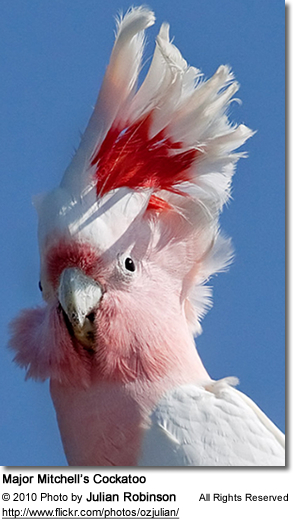 Unlike the Galah, Major Mitchell's Cockatoo has declined rather than increased as a result of man-made changes to the arid interior of Australia. Where Galahs readily occupy cleared and part-cleared land, Major Mitchell's Cockatoo requires extensive woodlands, particularly favouring Callitris, Allocasuarina and Eucalyptus. 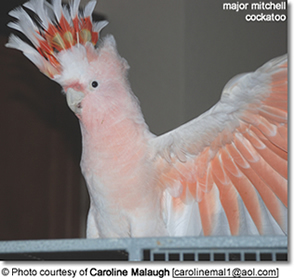 In contrast to other cockatoos, Major Mitchell pairs will not nest close to one another; in consequence, they cannot tolerate fragmented, partly-cleared habitats, and their range is contracting. Found across the arid and semi-arid inland, from south-western Queensland south to north-west Victoria, through most of South Australia, north into the south-west Northern Territory and across to the west coast between Shark Bay and about Jurien. In NSW it is found regularly as far east as about Bourke and Griffith, and sporadically further east than that. Inhabits a wide range of treed and treeless inland habitats, always within easy reach of water. Feeds mostly on the ground, especially on the seeds of native and exotic melons and on the seeds of species of saltbush, wattles and cypress pines. Normally found in pairs or small groups, though flocks of hundreds may be found where food is abundant. Nesting, in tree hollows, occurs throughout the second half of the year; nests are at least 1 km apart, with no more than one pair every 30 square kilometres. Heavy grazing of feeding areas resulting in the removal of seeding grasses and preventing regeneration of food plants. Loss of existing and future hollow-bearing trees. What needs to be done to recover this species? Manage grazing in feeding areas to prevent loss of food resources. Fence areas of habitat, exclude stock and control rabbits to assist regeneration of trees, shrubs and native grasses. Protect existing and future hollow-bearing trees for nest sites. Monitor known nesting sites to deter poachers. These cockatoos are very challenging to breed. Captive males can be very mate aggressive. The males can kill a hens very quickly. Double-entry nest boxes are usually preferred to allow a female under attack to escape. Spacious aviaries with plenty of cover are also recommended. Males need to be taken out of a breeding program if they show aggression towards their mate.